In the musty attic of an upstate New York house, a woman finds a clasped box, hidden away for over a century. Inside, wrapped in cambric and tied with a green ribbon, is an old manuscript written by a girl dreaming of a better life, fighting for survival, and coming of age in a time of chaos and danger. This wondrously told tale is a stirring adventure set in nineteenth-century England, a novel of rich history and vibrant imagination. Amid the lush fields and gardens of an English estate, in a kitchen where every meal is a sumptuous feast, a young servant called Paddy anxiously hides her true identity. Using coal soot and grease, she conceals her flaming head of red hair and covers her body, desperate to keep the job she needs to survive. But the girl, whose real name is Mina, cannot conceal from herself the pain of her past or the beauty of an Ireland she remembers with love and grief—until she meets a man who convinces her to trust him, a man hiding sorrows of his own. To the mysterious Mr. Serle—the estate’s skilled and quiet chef—Mina dares to confess her true identity and reveal a shattered past: her flight from the blighted fields of her homeland to the teeming streets of Liverpool...her memories of the family she lost and dreams for the future. And as Mina and Mr. Serle begin to know each other, an extraordinary journey begins—a journey of faith and identity, adventure and awakening, that will alter the course of both their lives. The sights and sounds of nineteenth-century England come vividly to life in Jonatha Ceely’s magnificent novel, a tale that explores the intricate relationship forged by two people in hiding. 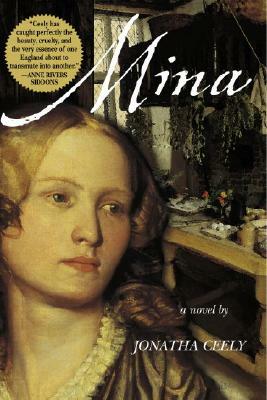 Moving and unforgettable, Mina is historical fiction at its finest—a novel that makes you think, feel, and marvel…until the last satisfying page is turned. Jonatha Ceely grew up in Canada and has lived in Turkey and Italy. She is a former teacher and administrator who lives in Brookline, Massachusetts, with her husband, who is a composer and teacher. She is currently at work on her second novel.